This is a place of hope, meaning, And purpose. Visit us and become a part of something bigger: a movement that is changing lives. 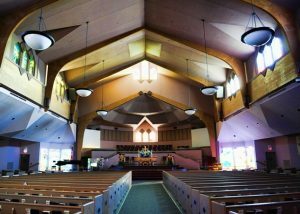 What is the atmosphere like at FUMC Allen? Our church atmosphere is Come As You Are. We want you to feel at home from the moment you step through the doors. Whatever stage of life you are in, married, single, youth, young or senior adult, we have a welcoming atmosphere that reaches all generations. On Sunday morning, we have greeters at our entrances and a main information/welcome table is set up in the the labyrinth area, just outside the main sanctuary entrance. We offer free coffee and donuts to our guests. We have three different hour-long worship services at FUMC Allen – 8:15 Blended, 9:30 Traditional and 11:00 Contemporary. Learn more here. What are the people like at FUMC Allen? The people of FUMC Allen are a friendly group who genuinely welcome all who attend. They are people just like you who share many of the same struggles and concerns of daily life. Our members are supportive without being intrusive or judgmental. What does FUMC Allen offer for children and youth? Children and youth are encouraged to attend worship services. Sunday worship often includes a special children’s time that takes the pastor’s sermon and presents it at a level that meets a child’s understanding. We offer Children’s Sunday school at the 9:30am and 11:00am hours where children and youth learn more about the Bible and their faith. Nursery is open throughout the morning for children ages two and younger. Youth Sunday school classes meet in the youth wing at 9:30am and 11:00am with classes established for each grade level. How can I keep up with what’s going on at FUMC Allen? If you have visited us in worship and want to learn more, take a little time visiting our site. We highly recommend you subscribe to our email newsletter, This Week at FUMC Allen by clicking on this link. United Methodists make up the third largest denomination. We are a melting pot of people from all kinds of backgrounds who come together to worship God, follow Christ’s teaching, love our neighbors, and make a difference in our community and world. We believe we are called to be the hands and feet of Christ as we live out his message. United Methodists rely heavily on scripture, reason, tradition and experience to help us interpret the faith and how to daily live out the faith to the best of our ability. UM’s are all connected. Everywhere you see a United Methodist congregation it is safe to assume we’re related because we are all working together to make disciples of Jesus Christ for the transformation of the world. If you would like to dig deeper, you can learn a lot on the Basics of Our Faith pages of the United Methodist Church website. Feel free to contact any of our pastors if you have specific questions about Methodism. If you want to learn how to join, contact Rev. Maxie Moore and she will get you started.